This is not really a new concept, we already came across Intel Compute Stick. But ASUS + Windows 10 is something that matters even if it isn’t new. 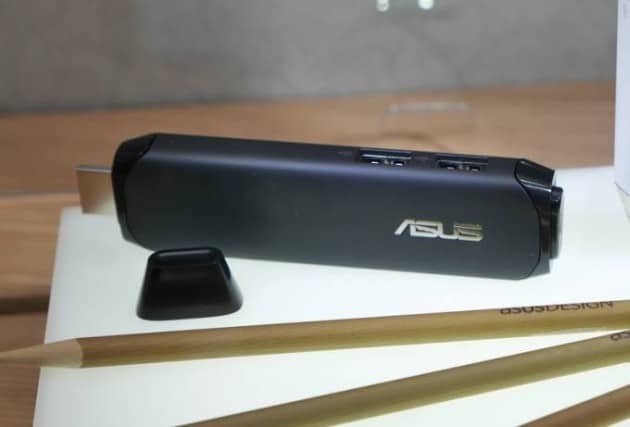 At Computex, ASUS unveiled a Mini PC or a pc-on-a-stick called the ASUS Pen Stick and it is powered by Windows 10. It has a Cherry Trail processor and it can perform all the decent tasks. It is a portable device, you can carry it anywhere just by keeping it in your pocket. It is indeed a portable Mini computer with good configurations. People might often get confused with this device as a pen drive or a Chromecast, though it more or less looks like the same. If you can compare Intel Compute Stick with ASUS Pen Stick, the latter comes with a fanless design. Usually such devices have fans to avoid overheating and throttling CPU speeds. But lets wait and see the final product. ASUS Pen Stick has a power button on the side plus an HDMI connector. It is powered by Cherry Trail processor and boosts 2GB of RAM. With just 32GB (SSD) of onboard storage, it runs Windows 10 smoothly. Apart from this you also get a microSD card reader, two USB 2.0 ports, and an audio jack for mic & headphone. Bluetooth 4.0 and Wi-Fi 802.11 b/g/n are supported. It is available in two color variants – black and white. This is not the first PC Stick by ASUS, they already launched something called “Asus Chromebit” long back which has Rockchip RK3288 processor, 2GB of RAM, 16GB of storage, 802.11ac WiFi, and Google’s Chrome OS. It was priced around $100. The ASUS Pen Stick will be released in the fourth quarter of this year. It should be priced around $150. Looking forward to get this device in hand to review it properly, do wait for the post. What do you think about this device? Do let us know your views in the comments below.